The full text of this Treaty is available on a most useful website, http://anno onb.ac.at, which contains images of the complete "Reichs-Gesetz- und Regierungsblatt" from 1848. The "Vertrag zwischen Oesterreich und Preußen vom 6 April 1850" is on pages 1037 to 1050. Open the site, select Gesetzestexte, click 1850 in the table-of-years, in the Gesetzestexte: zu/ab Seite box drag the selected number down to 1037, click the GO button to its right and there it is! Navigate via the < > arrows at the top: nächste Seite means next page. The URL for the first page is here. The Austro-German Postal Union came into being to simplify the exchange of mail between the Austro-Hungarian Empire and the various states of Germany and, most importantly, to provide a uniform postal rate structure. It proved to be extremely successful and was to be the model for the creation of the U.P.U. from 1874 onwards. It began with an agreement concluded on 6th April 1850 between Prussia and the Austro-Hungarian Empire, which was to take effect on lst July 1850. By then, Bavaria, Saxony and the two Mecklenburgs had agreed to participate and by 1st June 1852, all the remaining German States, both large and small, had joined. The first Union Postal Conference took place in Berlin in Dec 1851 and an extended Union Treaty was drawn up to operate from 1st July 1852. Further Conferences resulted in revisions and extensions to the agreements from lst June 1856, 1st April 1858 and lst Jan 1861. The Union Treaty laid down letter post rates for mail between the States at uniform rates, but stipulated that, for mail within each member state, rates could be fixed at whatever level that state desired. In addition to these basic letter postage rates, registered, express delivery and insured letter rates were quickly adopted. At subsequent Conferences, systems for money transfer and money collection (cash-on-delivery) were set up and refined. As regards the parcels service, while interim arrangements operated from 1st July 1852, a universal rate structure did not begin until 1st April 1858. Parcels were accompanied by a letter, or 'Paketbegleitbrief'. These had been used in the Austrian and German areas for the parcels service for many years (from as early as 1750) and were the precursor of the more familiar parcel cards that were introduced in 1878 in the Austro-Hungarian Empire. The parcel post fee paid for the carriage from the departure post office to the destination post office only. The parcel and its parcel letter were despatched separately and matched up on receipt at the destination post office. This process was assisted by the use of identification labels with a number and often the despatch office name. A small one was stuck on the parcel letter, and a much larger one, with the same number was applied to the parcel itself. Prussia had used these from 1850, but they do not seem to have been used in the Austro-Hungarian Empire until 1863. The parcel letter was delivered to the addressee and he would go to the post or parcel office to collect his parcel. If he elected to have it delivered to his home address, an extra fee was payable. This description provides an initial point of interest. When the Austrian currency changed on 1st Nov 1858, 21 gulden ÖW, were equal to 14 Thaler, so the Austrian value of 260 Thaler might be expected to be 390 gulden. However, in 1860, the value of the Austrian gulden declined by about 1/6 , following the disastrous war of 1859 with France and Italy which resulted in the loss of the wealthy province of Lombardy. The quoted amount of 470 gulden is consistent with this decline. On a parcel letter, it is usual to find the weight of the parcel and the postal charge, either prepaid or payable on arrival. In this case the weight is at the upper right, shown twice, as 8 pfund 251/2 loth and 9 pfund 236/10 loth. The second of these is in Zollpfund of 30 loth, each of 500g, the Austro-German Union weight unit. This was intended to provide a standard unit, rather than the widely varying pfunds in use in different parts of the German-speaking areas. These were all of 32 loth, but in Prussia the pfund was of 467.7g, in Bremen of 498.6g, in Hamburg of 484.4g, in Frankfurt of 505.3g, and in Bavaria and Austria of 560g. The first of the two weights is in Austrian weight and equates to 4.926kg, while the second in Zollpfund equates to 4.893kg. On arrival in Berlin, the weight was checked and it was noted at the bottom left in blue ink as 9 pfund 25 loth, or 4.917kg. At the lower right, there is a circular mark W.G.A., which is of the Inspection Division at the Berlin Parcels Office, which checked incoming parcels with a declared value. 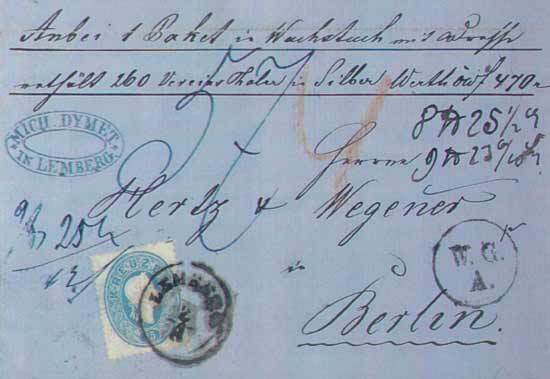 The postage was to be paid on arrival and is marked in blue ink, which was the standard Prussian way of showing postage payable, as 57 silbergroschen. This was the sum of two components, basic postage for weight and distance and an insurance fee based on the declared value and the distance. From 1st April 1858, the parcel postage within the Union was calculated according to the basic formula, in Prussian money, at 12 pfennigs to the silbergroschen, of 2 pfennigs per Zollpfund, or part thereof, per 4 German miles, or part thereof. The distance from Lemberg to Berlin was 788km, or 105 German miles, so this was 27 distance steps and there were 10 Zollpfund weight steps. Postage was 2 x 10 x 27 ie 540 pfennig, or 45 silbergroschen. For this parcel, the insurance was 4 x 3 sgr, or 12 silbergroschen. It should be noted that the data given on the charges for parcels here is only an outline to illustrate this item. The full system is rather more involved. There were minimum values for postage, based on the principle that the minimum rate for a parcel must be at least twice the corresponding letter rate. There were changes in these minimum values during the early 1860s and the insurance scale was also modified. There is one puzzle about this parcel letter. It bears a 15 kreuzer Austrian stamp. This seems to be superfluous, as, provided a 'Paketbegleitbrief' did not exceed 1 loth in weight, there was no charge for it. A charge was only made if the letter exceeded 1 loth, at the letter postage rate per loth for each loth above 1 loth. As it stands, this letter is not overweight, nor is there any indication of an enclosure. It does seem that the stamp was applied in error by the sender when he delivered the parcel to the despatch office. These notes can only provide a brief survey of the Postal Union, but it did have an enormous influence on subsequent developments in the exchange of mail between the nations of the world.